Bear Center at Grinnell College. 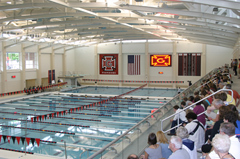 Grinnell College dedicated its new $90-million athletic and recreation center over the weekend. Phase two of the project includes a natatorium with a 50 meter pool as well as a fieldhouse with a six lane 200 meter track. Grinnell athletic director Greg Wallace says for the most part construction has remained on schedule. Wallace says it has gotten behind and then moved ahead depending on the weather, and now things are on schedule to be ready in August. The project also includes new tennis courts, racquetball courts, training and equipment rooms. He says the coaches, athletes and student body are looking forward to moving into the new facility.